Sometimes I catch myself thinking silence is not important and actually a waste of my precious time. There are always chores to do, people to communicate with and ‘busi-ness’ to busy myself with. If life is so short, why bother sitting still once or twice a day? Why be alone if I can relate to and have fun with others? Why be idle if I can be working? The Benedictine monks as well as the author and priest Henri Nouwen (in his book Out of Solitude*) recognized the value of silence and solitude. Noise spreads my focus thin, silence enhances it. If my mind is like a laser beam, I am sharper, more focused and present in and after a period of silence. Distraction is a post-modern public enemy and we need silence as a healthy antidote, to stop the addictive yearning for always more stimuli. Silence is a gift to myself, reconnecting to a power greater than me, someone I call God, just as the Benedictines and Nouwen do. A way of really being present. When I am not ‘home’ in my own heart, who can I receive there? Listening to something or someone greater than ourselves requires turning inward instead of being in a constant reactive state. We might receive an intuitive thought or helpful guidance when we ‘just’ sit still for a while. Being attentive to another person is another fruit I can reap from spending time in silence and solitude. I’ve noticed that my habit of being still morning and evening is developing, now that I’ve grown accustomed to a big change in my life. I love living this life, seasoned with some Benedictine flavour! How are you doing this week, developing some Benedictine habits? If you liked this post, please considering signing up for email notifications or “like” this on Facebook. Spread the word, word of mouth rocks! Want to learn being ‘home’ in my heart more and more. You’r right. Who can I recieve there, when I’m not at ‘home’? Searching for “Out of solitude”. Sold out (in Dutch), also ‘second hand’. I’ve noticed you’r making progress; living the Benedictine way! Glad to read this post. More and more I feel this longing; to be in His presence (awesome to have a silent room). “It promises new life. 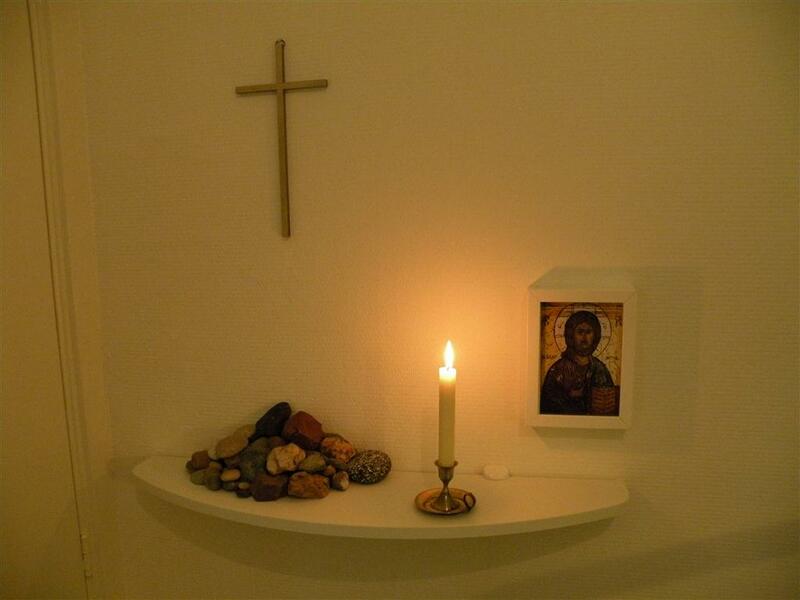 It is the silence of peace and prayer, because it brings you back to the One who is leading you” It is, Ester. Thanks for posting! I also received some very valuable comments on my humility quote. Very grateful. Just got my own DVD of into great silence. Can’t wait to watch it again. It also has behind the scenes material. Cool. hi DIAC, I really fell off the writing bandwagon because of my new work. It felt really uncomfortable because of feeling torn inside and having things to share but not finding time and rest to write them down. Today I make a new commitment to this beautiful subject of my Blog. I’m very well. Thanks! How are you doing? Please don’t to feel unconfortable because of this other priority, wich I can understand. Just back from a amazing rally trough Eastern Europe. My son asked me – for the second time – to go with him and his friends. We crossed 9 country’s in 5 days with an old car (value: 500 euro). It’s called “The Garbagerun”. http://www.garbagerun.nl Amazing experience! For example; never new Slovenia is such a beautiful country! Next two weeks of my vacation will be without social media, because of a silent basic outdoor experience. I’m looking forward to your post. For me a new commitment too 😉 Like to respond in August. Have a wonderful summertime. Wow, that sounds amazing! And awesome you have such a close relationship with your son! And great idea, unplugging from social media for 2 weeks. I am looking forward to planning another silent as well! I am not so much the outdoorsy hiking type, but I love to draw, write, pray and be silent or walk through nature. Talk to you in August! thanks you so much for your compliment! I really appreciate that!! thanks dear paul, how are you doing in Spain?